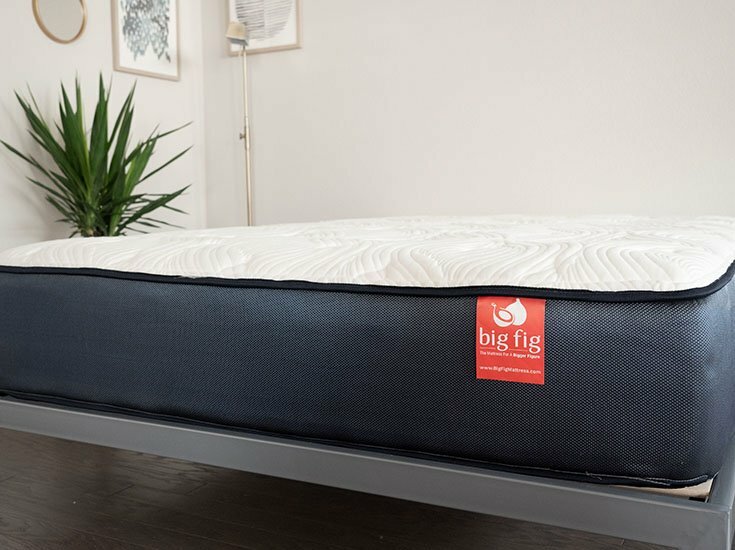 Big Fig Vs. Helix Nightfall Mattress - Which Will Be The Perfect Fit? Home » Big Fig Vs. Helix Nightfall Mattress – Which Will Be The Perfect Fit? Big Fig Vs. Helix Nightfall Mattress – Which Will Be The Perfect Fit? In the past, it was difficult to find a good mattress for heavy people. Many larger people had to settle for an extra firm mattress regardless of their specific sleeping preferences. Thankfully, there are now some fantastic mattresses built specifically for larger sleepers. The Big Fig and Helix Nightfall are two mattresses designed to be durable and support heavier weights. These mattresses are also designed to fit different sleep preferences. Which large person mattress will be the one for you? Read on for my full comparison. Both mattresses are made for heavier people. These are both hybrid mattresses. Both should keep you from overheating while you sleep. The Big Fig is designed to handle much heavier weights. The Big Fig is firmer than the Helix Nightfall. The feels are slightly different. The Big Fig has a bit of a pillow-top feel, and the Helix Nightfall has a bit of that slow-sinking, memory foam feel. The cover is 1″ of quilted ThermoGel foam. The Helix Nightfall is 12” tall. The cover has two layers. The top layer can be zipped off and replaced with an Ultra Cool Cover. First, there is 1” of Helix Dynamic Foam. It is a latex-foam hybrid. Then, there is a 1” layer of Ultra Dense Memory Foam. This is followed by a 1” High-Grade polyfoam transition layer. Next, there are 8” of individually wrapped coils. Finally, there is 1” of a Dura Dense foam. Read our full review of the Helix Nightfall mattress HERE. The covers of these two mattresses are quite different. The Big Fig has a tufted cover that is quilted with polyfoam. The Nightfall has a dual cover that is breathable. While these are both hybrid mattresses, the top comfort layers are somewhat different. The Big Fig has higher density foams on top, and the Helix Nightfall has a softer foam on top. Because of this, the Nightfall will have more of a slow-sinking, memory foam feel. Both mattresses have taller coils, but the Big Fig has more coils across the mattress. They should both be able to handle heavy weights, but the Big Fig should be even more supportive for much larger people. These should both be cooler sleeping mattresses. The coils in both should allow for good airflow. The Big Fig also has a perforated layer of gel memory foam that should promote even more airflow. The Nightfall has the optional Ultra Cool Cover, which can help dissipate heat. 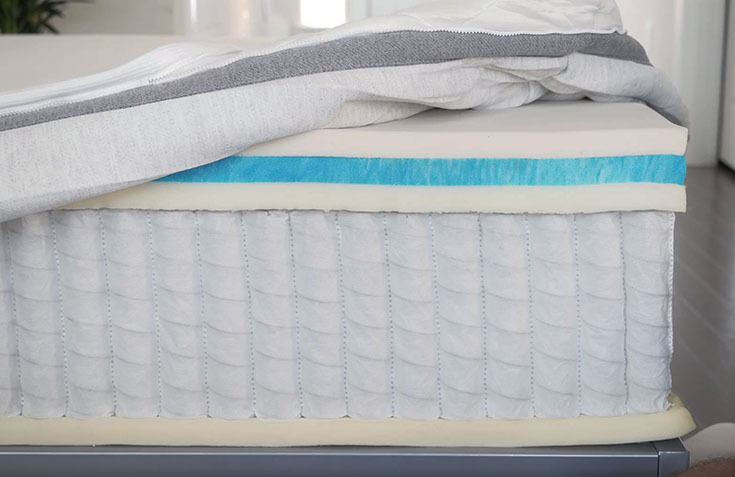 While both should be longer-lasting mattresses, the Big Fig has higher-density foams and more coils. This should make it a bit more durable. In terms of firmness, the Big Fig felt like an 8/10 and the Helix Nightfall felt like a 7/10. They are both firmer than average, but the Big Fig is definitely the firmer of the two. When I was on my back, the Big Fig was actually too firm for me. My hips didn’t sink in, and they were even pushed up somewhat. I felt like I was arching my back on the Big Fig. On my side, I also felt too much pressure on my shoulders and hips. Note that I am 230 lb, and the Big Fig is rated for up to two 500 lb sleepers. I may be too light to activate the top layers. On my stomach, this firm mattress was definitely supportive enough. I felt better lying on my back. My hips sunk just a bit but not too much. I felt well supported, and the top foam layers pressed into my lumbar area. On my side, I did feel some pressure on my shoulders and hips, but not as much as I felt on the Big Fig. On my stomach, I was supported, but not as well as I was on the Big Fig. Both mattresses have a balanced hybrid feel overall, but their top layers do make them feel a bit different. The quilted polyfoam on the Big Fig gives the mattress a slight pillow-top feel. The softer foam layers on top of the Helix Nightfall give it a bit of that classic memory foam feel. The Big Fig has a bit more bounce and, partly because it is firmer, I had an easier time moving around on the mattress. See more about what I thought of the Big Fig’s firmness and feel in the video below. Now compare this to the memory foam feel on the Helix Nightfall. During my tests, both mattresses performed about the same in regard to motion transfer. The glass was disturbed a bit on both mattresses. However, both the Big Fig and Helix Nightfall should ensure that you don’t feel too much of your partner’s movements on your side of the mattress. They could both be decent options for couples. See how the Big Fig fares when it comes to motion transfer in the video below. See how the Helix Nightfall’s memory foam absorbs my motion. If you are a larger person, you also want to think about how much of the mattress’s surface you can actually use. This becomes doubly important if you sleep with a partner. When it comes to edge support, I felt more secure sitting on the edge of the Big Fig. Likewise, when I was lying down, I felt very secure even when I was close to the edge of the Big Fig. It is the firmer mattress, and it compresses less than the Helix Nightfall. You weigh between 300 and 500 pounds. The Big Fig is rated for heavier weights than the Helix Nightfall. It is designed to be even more supportive for people within this higher weight range. If you are over 300 pounds, this should be the better choice. You are a heavier stomach sleeper. This is definitely the firmer of these two mattresses. It should ensure that your hips don’t bow in and take your spine out of alignment while lying on your stomach. If you are larger and a stomach sleeper, the Big Fig is probably the one to pick. You are looking for a long-lasting mattress. Between these two mattresses, the Big Fig has a more durable construction. The foams are very high-density, and the high number of coils should add some life to the mattress. You are a heavier side sleeper. While I did feel some pressure on my shoulders and hips while lying on my side on the Helix Nightfall, between the two mattresses, the Helix Nightfall is a better fit for side sleepers. I definitely felt some serious pressure when I was side sleeping on the Big Fig. You are a heavier sleeper under 300 lb. The Big Fig might be too firm if you are under 300 lb. If you are larger, but not over this weight, you should get a good balance of comfort and support on the Helix Nightfall. You prefer a softer memory foam feel. Overall, the Nightfall has a balanced hybrid feel. However, you do get some soft memory foam on top. If you like a bit of that slow-sinking, memory foam feel, this is the mattress to go with. If you consider your weight and sleeping preferences, the decision between the Big Fig and Helix Nightfall should be an easy one. The Big Fig should be a good fit for much larger sleepers and heavier stomach sleepers. Heavier side sleepers who like a classic memory foam feel should choose the Helix Nightfall. Please leave any specific comments or questions about the Big Fig or the Helix Nightfall in the comment section below. Thank you for reviews! I can’t wait until I have money to get a new bed. I’m disabled,heavy and a side sleeper that goes from hot to cold!! It will be nice to get more than 3 hrs. of sleep.